The two candidates in the runoff to become the Democratic nominee for Texas governor will meet tonight for their first and only debate. 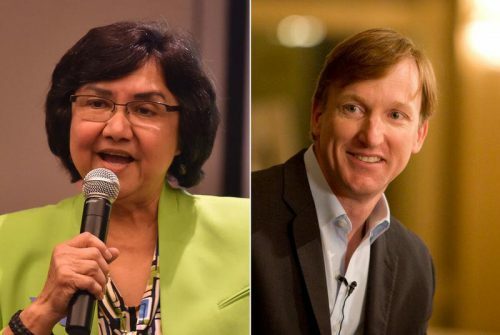 Former Dallas County Sheriff Lupe Valdez and Houston businessman Andrew White took the top spots in the March primary. They share many of the same priorities, but have occupied different spaces in the Democratic spectrum. White, the son of former Gov. Mark White, has been viewed as a moderate Democrat. Meanwhile, Valdez, who is seeking to become the Democrats’ first openly gay gubernatorial nominee in Texas, has staked out territory on the liberal side of the party. The debate will take place at St. James Episcopal Church in East Austin, starting at 7 p.m. The election is May 22. The winner will face incumbent Gov. Greg Abbott in November. Watch the livestream of the debate, courtesy of KXAN-TV. This entry was posted in KRTS News, KXWT News and tagged Governor, texas. Bookmark the permalink.